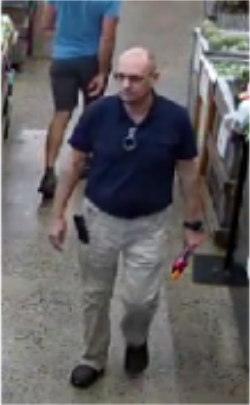 Video surveillance image of a man police suspect of stealing a $200 cooler. At about 5:40 p.m., the man left the store, located at 150 Ledge Road. Several days later, by Sunday, Oct. 14, a store inventory showed the cooler was missing, and employees reviewed the surveillance images. At 11:44 a.m. that day, the store informed police about the matter.